•You and your four-year old keep getting locked in a Battle of wills, and your child always seems to win. •When you tell him to do something he does not want to do, he ignores you. •When you tell him not to do something he wants to do, he throws a tantrum. Is this only a phase?' you Wonder. Should I just hope that he grows out of it? You can teach your child to obey. But before we discuss how, consider one possible reason for his misbehavior. When your child was a newborn, your primary role was that of caregiver. You were at your child's beck and call. All he had to do was whimper, and you came running, anxious to cater to his every need. Of course, such a response was proper and necessary. A newborn or infant needs a parent’s constant attention. His little "autocracy" has crumbled. His parents no longer follow his orders; they expect him to follow theirs. This is a rude awakening for children! Some respond by throwing tantrums. Others test their parents authority by refusing to obey. 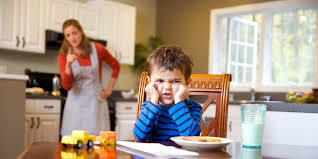 At that critical time, a parent needs to assume a new role- that of an authority figure who gives clear direction as to what is expected of the child. But what if the child ignores or rejects that direction, as depicted in opening scenario? If you say no, stick to that, and present a united front with your spouse. if you decided on a consequence for disobedience, follow through. Do not get embroiled in negotiations or endless discuss why you made a decision. It will be much easier for your child- and for you- if you let your Yes mean yes and your No mean no. The family is neither a democracy nor a dictatorship. Rather, it is a God given arrangement in which children can be lovingly guided towards responsible adulthood. As part of that process, discipline will teach your child to obey and help him feel secure in your love.